Curious kids want to know. Now you'll have the answer! 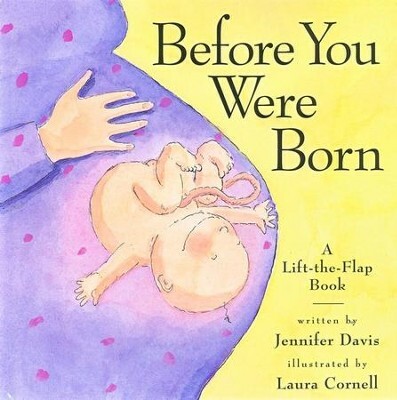 Through lighthearted verse, comical illustrations, and charming lift-the-flap format, Davis tells her children the pre-birth story of how they grew and how she felt, month by month, from the start of pregnancy until mother and child met, face-to-face. Your kids will know they are part of the family! 24 pages, hardcover from Workman. Laura Cornell has illustrated many children's book, including Jamie Lee Curtis's Tell Me Again About the Night I Was Born and When I Was Littleand Leah Komaiko's Annie Bananie and Earl's Too Cool for Me. She lives in New York City. Jennifer Davis, a mother of four, wrote Before You Were Born to answer the questions her older kids asked while she was pregnant. She lives in Beaufort, South Carolina. I'm the author/artist and I want to review Before You Were Born.